In my parent’s kitchen there was a hook near the door. It pretty much always had Columbus Italian dry salami hanging from it. It never occurred to me that this was not the case in every house in America. When I was growing up it was my sister who had the sweet tooth, not me. I loved all things savory. I remember asking my mother if people could choose to be vegetarian, could I be a carnivore? I didn’t hate vegetables, I just loved salty foods. I still do. Some of my favorite things when I was young were thick cut potato chips, corn chips, smoked salmon and salami. When I had one of my first jobs, working at a gourmet retail shop, I’d head off to a nearby Italian deli for lunch most days. They refused to sell sandwiches but would sell meat sliced to order and rolls and throw in packets of mustard and mayo so you could make a sandwich yourself. Salami with or without mortadella was my fuel and my soul food. Years later when I lived in Italy I discovered many other styles of Italian cured meats and other ways of serving it—proscuitto with Tuscan bread, mortadella draped over warm gnocco frito and various kinds of salami flavored with black pepper or fennel or red chiles. Italian dry salami it turns out, is a Bay Area speciality. According to an article in the Los Angeles Times, around 1970, local Bay Area salami producers, descendants of salami makers from Milan, Lucca, Parma and Modena formed the Dry Salami Institute and were able to convince the US Department of Agriculture that Italian dry salami should be made according to certain standards and the name protected against inferior products. It is really Italian? That’s hard to say since it’s made in America and has a pungent scent and flavor profile particular to this area. It’s definitely a Californian style of Italian salami and although producers like Columbus make many different varieties such as Calbrese, peppered and sopressata, nothing reminds me of my childhood quite like an Italian dry salami, hanging from a hook. Here’s a simple rule—for smaller chubs, cut thicker slices and for larger ones, cut thinner slices. This will allow for the best taste, texture and aroma. Although shelf stable, after you cut into a salami, it’s best to store it in the refrigerator to prevent dehydration. Salami needs humidity, so keep it in a moist plastic bag (you can include a wet paper towel in a resealable bag if necessary). 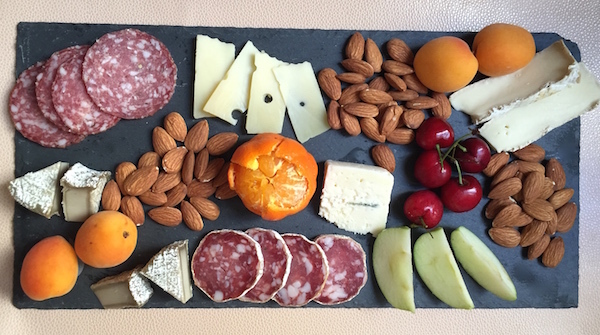 Salami is often served on an antipasto platter, but consider adding it to a fruit and cheese plate. It pairs well with so many things—nuts, stone fruit, grapes, apples, pears, grilled vegetables and olives. Let salami come to room temperature before serving. Disclaimer: My thanks to Columbus for inspiring this post and providing samples. I was not compensated monetarily for this or any other post on Cooking with Amy.